Take The Hunger Games, Life as we Knew it, and The Declaration roll up up into a nice little ball, take out all the bad parts, add some Dashner-flair and a puzzle and voila! 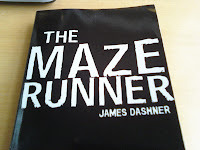 You have The Maze Runner. "When Thomas wakes up in the lift, the only thing he can remember is his first name. He has no recollection of his parents, his home, or how he got where he is. His memory is black. But he’s not alone. When the lift’s doors open, Thomas finds himself surrounded by kids who welcome him to the Glade, a large expanse enclosed by stone walls. "Just like Thomas, the Gladers don’t know why or how they got to the Glade. All they know is that every morning, for as long as they could remember, the stone doors to the maze that surrounds them have opened. Every night, they’ve closed tight. Every thirty days a new boy is delivered in the lift. And no one wants to be stuck in the maze after dark. "The Gladers were expecting Thomas’s arrival. But the next day, a girl springs up—the first girl ever to arrive in the Glade. And more surprising yet is the message she delivers. The Gladers have always been convinced that if they can solve the maze that surrounds the Glade, they might be able to find their way home . . . wherever that may be. But it’s looking more and more as if the maze is unsolvable. And something about the girl’s arrival is starting to make Thomas feel different. Something is telling him that he just might have some answers—if he can only find a way to retrieve the dark secrets locked within his own mind." This book kept me on the edge of my seat! It held everything a good suspense/sci-fi/puzzle/thriller book should have. There was a mystery, a hero, his helpers, his villains, puzzles (I LOVE Dashner's puzzles), an apocalypse, a twist, monsters, and some violence. Honestly, I don't think this book was missing anything. The only thing I wish was different is that I wish it was longer. Then again, I read it in two days, and whenever I do that I tend to think the books are really short when they aren't. Plus, I was so excited by the end of the book that I just started to skim. I'm definitely going to have to re-read this one. That's all I'm going to say for now, I don't want to give away any spoilers. The Maze Runner comes out in October, and it's definitely one you want to keep an eye out for. Oooh, no wonder I had never heard of it. It sounds awesome. What books do YOU want to know about?